Perfect for the Dine en Blanc dinner event. 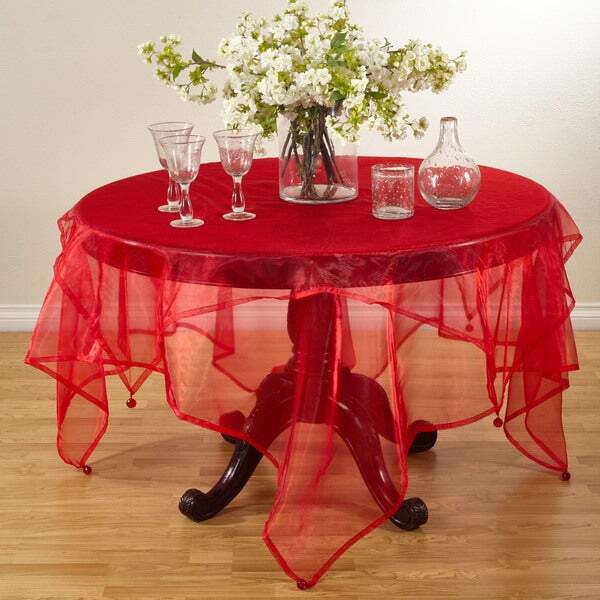 Add this tablecloth to your table from Saro Lifestyle for a fun, colorful look! This decorative topper is perfect for a variety of occasions and events. Dimensions 80.0 In. X 80.0 In. X 1.0 In. High quality, just exactly what I wanted! I bought one of these at a local store a few years back for twice the price, and this is the same thing! So excited to find! A lovely way to cover a table, but still have the sheer effect. I covered an end table, and it really dresses up the room, without adding the harshness of a solid color or pattern. Just the right size if you don't like your tablecloths to hang very long. This is so beautiful on my table this time of the year with my Christmas decor. Just what I needed for that special pop. I would order this again In another color after Christmas. This made my table really look beautiful for Christmas with the table decorated for Christmas. Elegant for Pedestal Tables !!! Would recommend for a touch of sheer color. Cute bling hanging from all 4 corners. Helps weigh the light cloth down. Sheer elegance. Would recommend for sure. Would not recommend this table cover. The quality of this cover is not worth the price of this item. I would not buy this item(s) again! Not worth the money! Very good value for the money. If there is ever an issue, Overstock always stands behind the product! Love, love , love it!! Second one I purchased. just don't like, it slide on table too much. These table toppers are exactly what I wanted. The material appears fragile and delicate which is exactly the look I wanted. But, it’s really well made and sturdy fabric. It is not really gold but a mocha color....should have known from the picture, but it did say "gold". Thin, but looks cute for Christmas! I have a BEAUTIFUL dining table and this tablecloth is the Icing on the cake without a doubt....COMPLEMENTS IT'S BEAUTY AND IS VERY CHIC!!! !